View our links for more information about our upcoming Everest Nepal, Lhotse and Everest Tibet expeditions. We are now accepting applications for the spring of 2011, so please join us for Everest, Lhotse, Cho Oyu and our treks and trekking peaks. 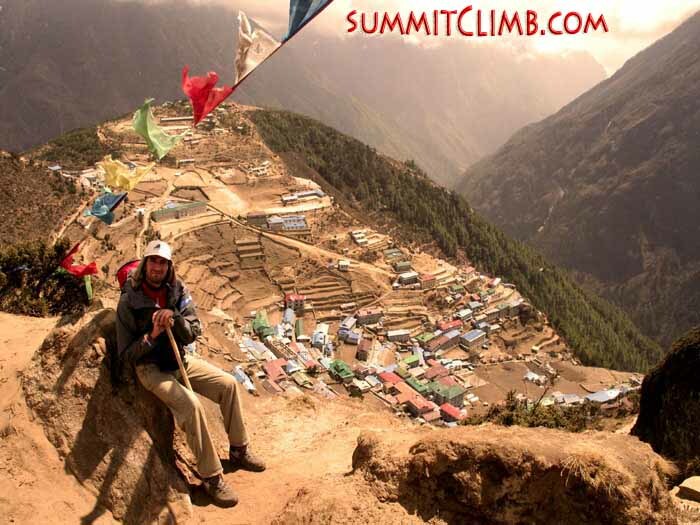 Hi, this is Raj reporting in from basecamp for the SummitClimb Everest/Lhotse expedition 2010. All the members are down safely in basecamp now. Karsten is ready to leave basecamp for Lukla where he’ll be taking a flight to Kathmandu. Mikko has just arrived from camp 2 to basecamp. Tomorrow he’ll be leaving basecamp, trekking to Lukla and getting his flight to Kathmandu. The sherpas are still up on the mountain. They’re cleaning up the camps and there is still some work to be done. It will probably take us about 3 days to finish all of the work at basecamp before the staff leaves also. Hello. This is Raj calling in for the SummitClimb Everest/Lhotse expedition 2010. Yesterday on the 23rd of May Karsten and 2 sherpas summited Everest at 8:00 a.m. and came down to the South Col very safely. Today they are packing the tents and will be coming down to camp 2 and possibly to basecamp. 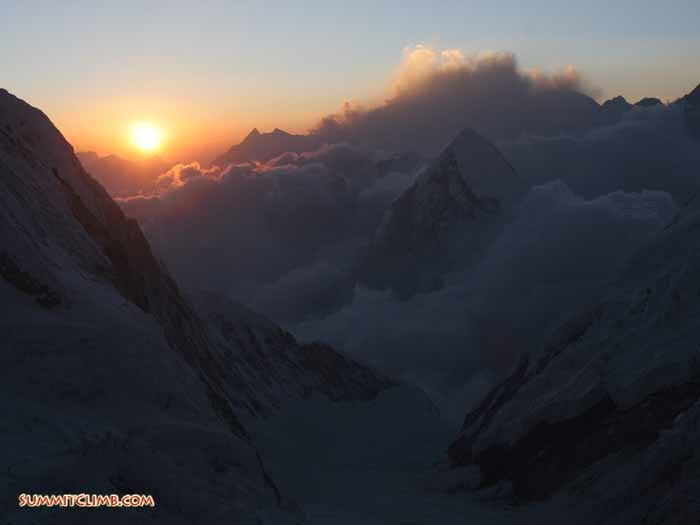 With our Lhotse team, Mikko is in camp 3 right now and they are planning to move up to camp 4 today. 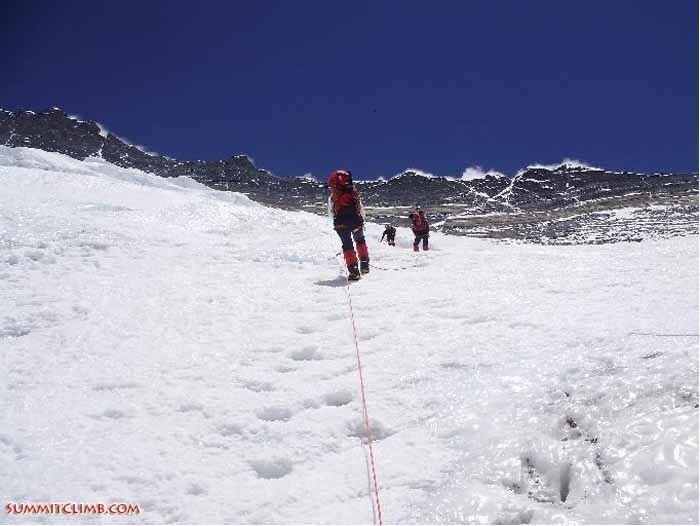 A few members from other Lhotse expeditions tried going for the summit but could not because the rope has not been fixed on the last section of the route. So let’s see what will happen. Hello. This is Raj calling in for the SummitClimb Everest/Lhotse expedition 2010. Today is the 22nd of May and it’s a very beautiful and sunny day. We have a few members still up on the mountain. Today Karsten is going to camp 4 from camp 3 on our Everest expedition. He will be attempting the summit with his personal sherpa. We also have Mikko in camp 2 for our Lhotse expedition. He is resting and tomorrow will go to camp 3. Our leader Raj called in to say that all members are doing well, safe and down in either basecamp or camp 2 right now. Yesterday Wiktor made the summit with Lhakpa Nuru Sherpa. Congratulations! He's in camp 2 with Karsten, Raj and Josette. Karsten will go for the summit again on the 2nd weather window, starting the 22nd of May, so has elected to stay in camp 2 to prepare. Manoj and Adam are down safe in basecamp. Below the south summit (Richard Pattison). We spoke to Everest Nepal team leaders Josette and Raj tonight. 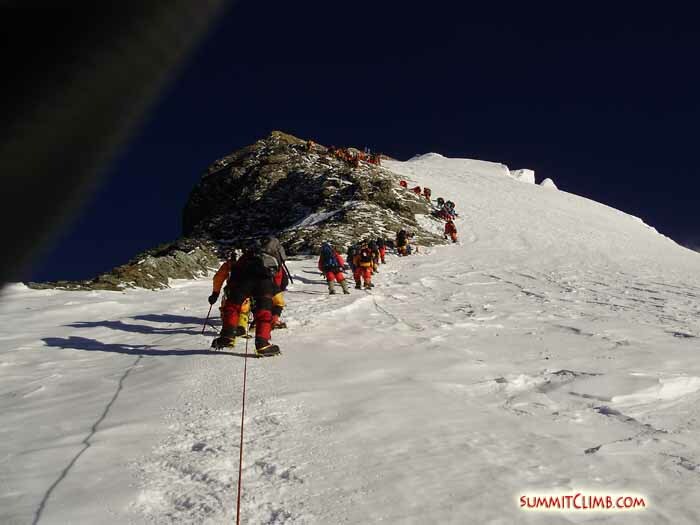 They are on the south col with Karsten and Wiktor and the sherpas, with the rest of the team in camp 2. Hi, this is Raj calling in from camp 3 for the SummitClimb Everest South 2010 expedition. One of our team members ascending the Lhotse face with the South side of Everest in the background (Samuli Mansikka). Hi, this is Raj calling in from camp 2 for the SummitClimb Everest Nepal 2010 expedition. Hello. Greetings from Everest basecamp. This is Manoj Vora bringing you the dispatch for Tuesday May 11th for the SummitClimb Everest Nepal and Lhotse expedition. The team spent the last 5 days in Pheriche. 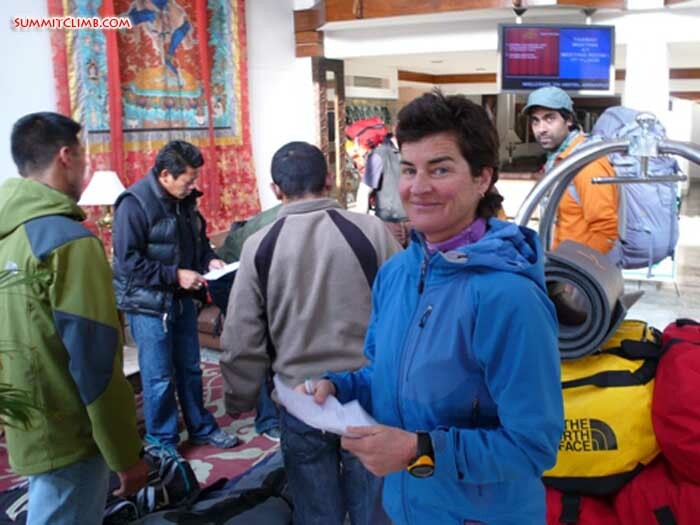 Team leader, Josette, stayed in basecamp to get things organized for the summit push. In Pheriche, the team members enjoyed good food, plenty of sleep, and access to the internet. All of us made a conscious effort to gain some weight. The change was a welcome one. We had left behind the barren landscape of basecamp and travelled to the land of juniper, green grass, gurgling streams, birds, flowers and lots more oxygen to breath. We also knew that this was only a temporary respite. All but one of the team members are back in Everest basecamp. The plan for now is a rest day tomorrow, followed by a staged ascent of Everest with all intentions of attempting the summit on the night of the 15th to the 16th. All of this remains subject to good weather. All team members are in high spirits and looking forward to the challenge up ahead over the next few days. We celebrated team member Karsten’s birthday with a very delicious cake today. The Khumbu Ice-fall and mountains at night (Samuli Mansikka). Our Everest and Lhotse members are well and resting in Pheriche. Our Sherpas are working on setting camp 4, which will be finished by 10th May. We plan to move from here on the 10th of May and check the weather once we get to base camp. I have been collecting weather reports and it seems the wind is still coming till the 14th of May. need to confirm. Once we get to base camp, I will send you an update. Thank you for following along our expedition. Greetings from Everest basecamp! This is Manoj Vora bringing you the dispatch for Wednesday May 5th for the SummitClimb Everest/Lhotse Nepal expedition. Between Friday the 30th of April and Saturday the 1st of May the entire team ascended to camp 2 at 6400 metres/21,000 feet in preparation to go up to camp 3 and spend a night to acclimatize. But as the old proverb goes; man proposes, God disposes. The weather here has been atrocious with overcast skies and snow showers, which makes for treacherous climbing conditions. Under such circumstances, 2 members descended to Everest basecamp on Sunday the 2nd. Monday the 3rd dawned clear, but climbing the very steep Lhotse Face was out of the question because of avalanche danger. The team at camp 2 sat out that day allowing the climbing conditions to improve. Finally on Tuesday the 4th we got our chance. The day proved to be a mixed bag of sun, overcast skies, and an occasional light snow shower. Four members started for camp 3 and three of them reached the 7000 metre/23,000 foot camp level after nearly 6 hours of tough climbing on very steep terrain. The one member who returned did reach the 6800 metre mark. Another member and I tagged camp 3 and returned to camp 2 for the night. The youngest member of our team chose to spend the night at camp 3 for additional acclimatization. Today is Wednesday the 5th of May. Except for the youngest member, we are all reunited in Everest basecamp. Every journey through the ice-fall has been awe inspiring. My words cannot capture the multitude of emotions invoked in each individual travelling through it. All members are doing well. We were saddened to see our team member, Mr. Charles Nuzum, depart due to health reasons. We wish him rapid recovery and will miss him. This is a dispatch for the SummitClimb Everest/Lhotse Nepal 2010 expedition on Saturday, the 1st of May. All of the team is here at camp 2 enjoying a bit of sun and rest before we climb to camp 3 on the Lhotse Face tomorrow morning. We intend to stay overnight and if we feel strong and the following morning we will climb to the Yellow Band at 7700 metres/25,300 feet before descending back to basecamp for rest. Then we’ll be ready for the first weather window and summit push. On a different note, Raj has asked me to tell all who are interested that he considers himself the most handsome man in the Western Cwm. Unfortunately; I cannot do this, as dispatches only make references to facts, not dreams. Our comfortable camp 2 at the foot of the Lhotse Face. Camp 3 covered in mist with the Geneva Spur in the background (Richard Pattison). Hi, this is Wiktor Mazur reporting in for the SummitClimb Everest Nepal expedition on Thursday April 29th. The last 4 days have been rest days here. We have been regaining strength for our acclimatization trip. What do we do on our rest days? We rest and talk, read books, play cards (at which Mikko has been the best lately), do laundry, and some of us took a walk down to a lower village for a change in scenery. Everyone is doing well, feeling good and looking forward to getting back up on the mountain. 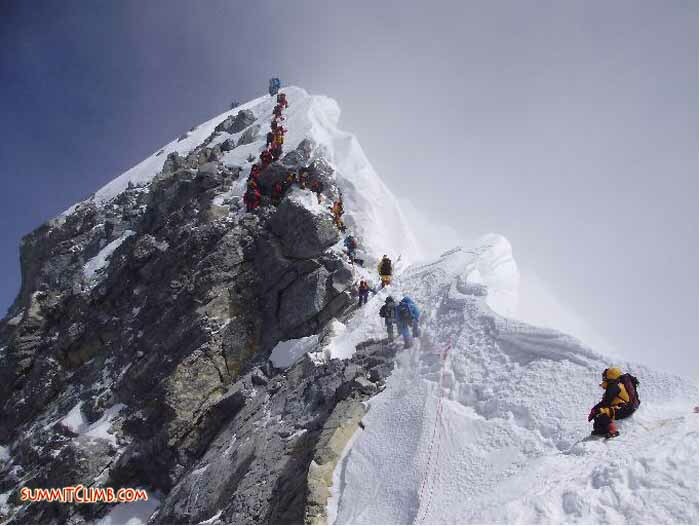 Climbers ascending the Lhotse Face (Richard Pattison). Hi, this is Manoj Vora with the SummitClimb Everest Nepal 2010 expedition. Today is Sunday the 25th of April. On Friday the 23rd all climbers ascended the ice-fall to camp 1. 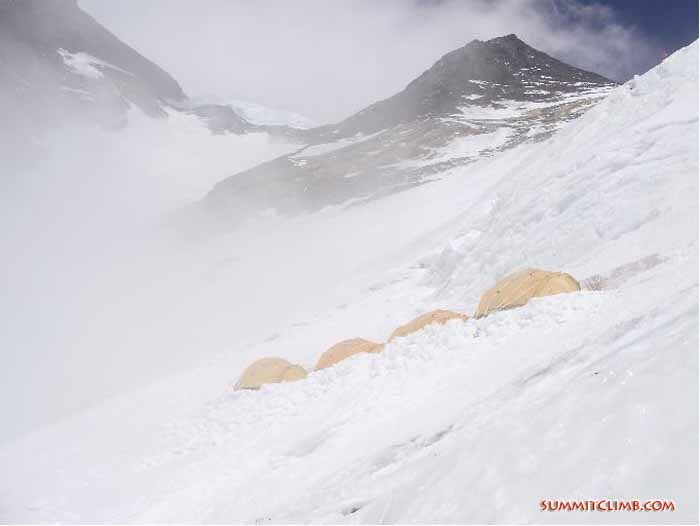 Two climbers spent Friday night at camp 1 while the rest of us ascended to camp 2, located at 6400 metres/21,000 feet and higher than the summit of Denali. 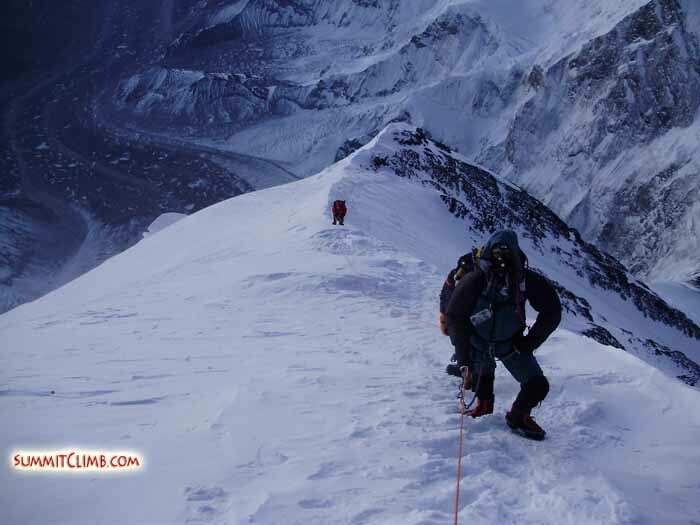 Acclimatizing to this altitude is essential to ascending higher on Mount Everest. On Saturday the 24th the two climbers from camp 1 joined us in camp 2. 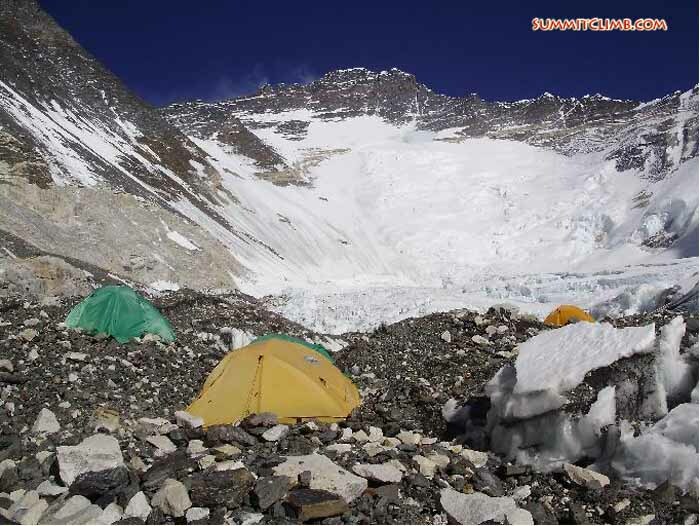 The team leader went up to camp 3 on the Lhotse Face to inspect the site for its safety. 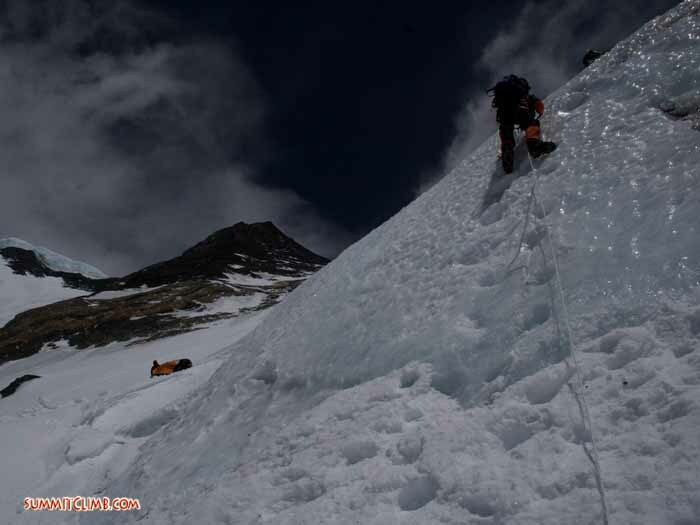 Two of the climbers went to the base of the Lhotse Face for an acclimatization walk. The rest of us rested in our tents at camp 2. As we ascend higher the views continue to be more and more incredible. The days have been a mix of sun, clouds and gusts of wind. Nighttime temperatures have been very cold. The variety of sounds on the mountain never fails to send a tingle up our spines. The loud snaps of tumbling seracs, roar of avalanches, deep grumble of the glacier in motion beneath us, and rock falls all remind us of nature that is constantly in transition and how for this short period of time we are trying to reside in harmony with nature. 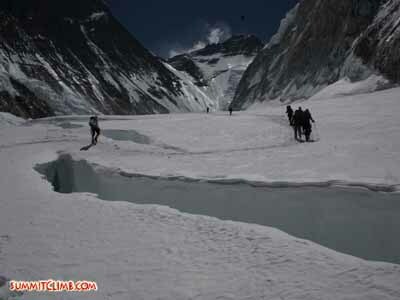 Today on Sunday all but 1 climber descended from camp 2 to basecamp. We will be looking forward to a few days of rest before we venture out into the ice-fall again on our way higher to camp 3. Hi, this is Wiktor Mazur reporting in for the SummitClimb Everest Nepal/Lhotse expedition for Tuesday, April 20th. In the last couple of the days we have had several members leave our expedition for various reasons and we will miss them very much. Those of us remaining are Josette Valloton, Adam Dixon, Karsten Holstad, Wiktor Mazur, Charles Nuzum and Manoj Vora on the Everest team. Mikko Vallanne remains on the Lhotse team. Yesterday was a busy one for everyone here. Half the group went up to camp 1 to spend the night there. Everyone is back safely in basecamp today. The other half of the group did an acclimatization hike to Kala Pattar, which has good views of Everest. Everyone is taking a rest day today in basecamp. We’re drinking and eating well, reading, relaxing, and thinking of the members who have decided to go back to their families. The view from camp 1 looking towards camp 2 and up the Lhotse face (Sam Mansikka). This assistant leader Adam Dixon sending in a dispatch for the SummitClimb Everest Nepal expedition on Friday, the 16th of April. Today we made our first go to camp 1 at 6000 metres/19,700 feet. We left basecamp at 4:00 a.m. to make best use of the cold night. The route climbs through the Khumbu ice-fall. This is the glacier that pulls from the valley between Everest, Lhotse, and Nuptse. Above basecamp the glacier is squeezed between Nuptse and lower and drops 600 metres, creating house-sized blocks of ice thrown together in one of nature’s best examples of chaos theory. When the sun comes up the reflective qualities of 10’s of millions of tons of ice create a golden heap that can bring both serac and mountaineer to the point of collapse, spoiling an otherwise interesting day out. All members climbed at a fast pace to get to camp 1 before the sun. Some made it and some turned around at the agreed safety cutoff time. We’re all safely back in camp now hydrating and resting, ready to go again in 2 days, sleep at camp 1 and make progress towards camp 2. 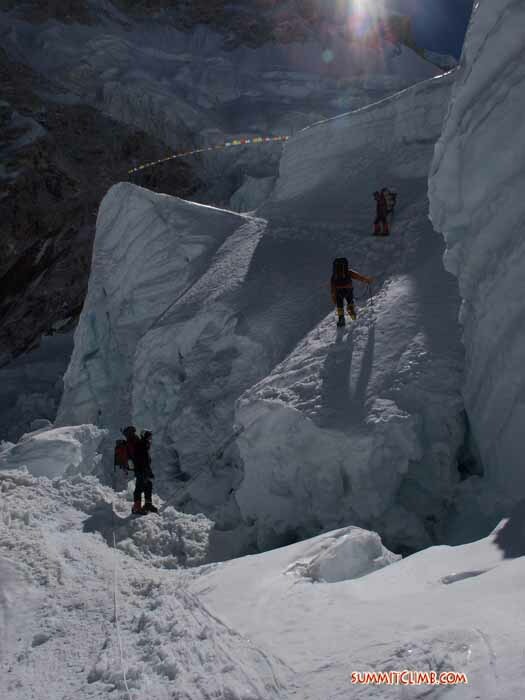 Climbers ascending the Khumbu ice fall. 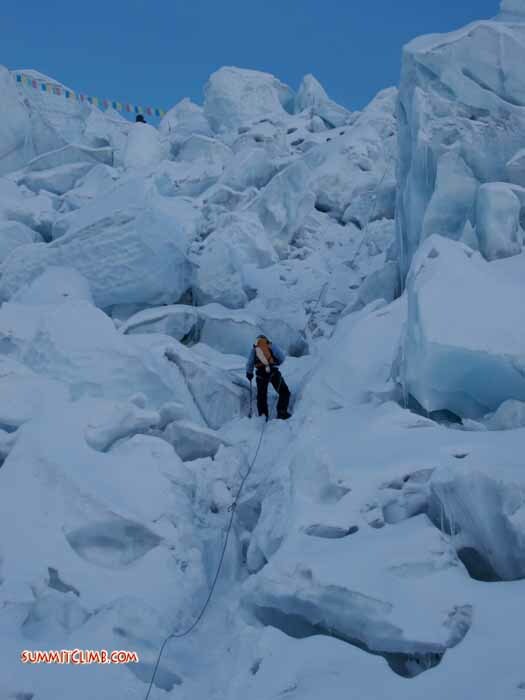 Josette in the Khumbu Icefall (Samuli Mansikka). Hi, this is Manoj Vora for the SummitClimb Everest Nepal 2010 expedition reporting the events of the last few days. This is the dispatch for April 11th. On Thursday the 8th we walked up from Pheriche to Lobuche, which was an easy hike. On Friday the 9th all of us hiked from Lobuche to Everest basecamp via Gorak Shep. We did not spend the night at Gorak Shep. At the end of this arduous day all of us we’re looking forward to the upcoming rest days at basecamp. Since starting our hike from Lukla we have covered a total distance of 51 kilometres and a vertical gain of 3.5 kilometres. Yesterday was Saturday the 10th and our first full day of rest at Everest basecamp. We took advantage by catching up on activities like reading, playing cards, chess, listening to music, doing laundry, etcetera. The days have been sunny and windy. We haven’t had any rain or snow so far. Today is Sunday the 11th of April. We performed an elaborate puja ceremony with the sherpas. It was very interesting. This was followed by a lot of festivities amongst the climbers and the sherpas. We have asked for blessings for our expedition to succeed. Everest basecamp on a misty morning. 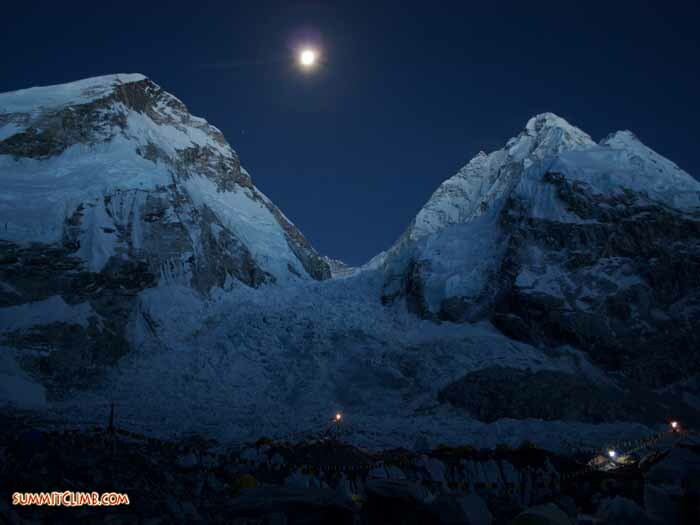 The Khumbu Icefall as seen from basecamp (Fabrice Imparato-2006). This is Adam Dixon, assistant leader for the SummitClimb Everest Nepal 2010 expedition sending a dispatch for Monday the 5th of April. Greetings to all of our friends and family around the world. Today we headed from Namche Bazaar for Pangboche after 2 days of rest and acclimatization. All members trekked at their own pace reaching our campsite from lunchtime onwards after a height gain of 500 metres/1640 feet. Some members seemed to like thin air, dust and yak dung more than others, but everyone is well and looking forward to getting to basecamp.